Distinguished from the Embioptera and certain Neuroptera, by its relatively primitive venation and mouth parts and by the fact that stoneflies always have three tarsal segments and two or three ocelli. They require moving water for development of the nymphs, and for that reason the adults are usually found near streams. There is a marked seasonal succession in the emergence of stoneflies, particularly in the northern hemisphere; adult stoneflies can be collected every month of the year in California if the proper locality is visited. Either vegetarian or carnivorous, depending upon the suborder. Stoneflies require a habitat with cool, welloxygenated water. The temperature of the water controls development and emergence; streams with marked temperature changes during the seasons usually display a distinctive sequence of emergence of various species. Some stoneflies occur only in large streams; some are found solely in small streams; still others frequent a wide range of stream sizes. Eggs: Females may deposit eggs over water while flying. Some species crawl to the water edge to deposit eggs. Eggs may be laid once or several times a year. Numbers of eggs is known to exceed 1,000. Eggs are generally spherical with a sticky coating which, when moistened, allows them to adhere to the substrate. Nymphs: In California, nymphs are not well known, but those in the midwest are. They occur in waters with a gravel bottom, but some species are found where the substrate is chiefly detritus. 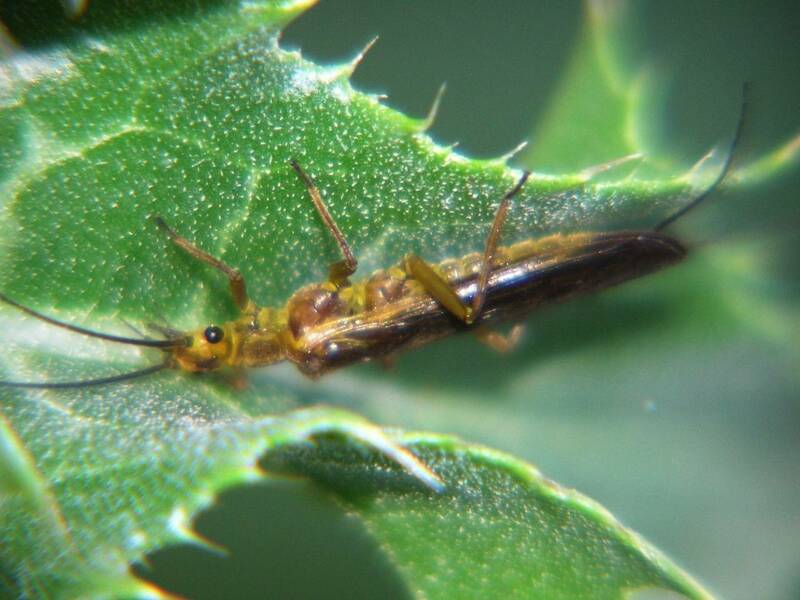 Plecoptera are intolerant of water pollution and presence of the order in aquatic systems is an indicator that aquatic ecosystems may be healthy. Bulletin of the California Insect Survey. Volume 6, No. 6. The Stoneflies (Plecoptera) of California. Stanley G. Jewett, Jr. (U.S. Bureau of Commercia1 Fisheries, Portland, Oregon). University of California Press. Berkeley and Los Angeles. 1960.